Theresa May has nothing left to offer apart from delivering Brexit. Jeremy Corbyn eyes a brighter future in which he could confound the odds once again and make it to Downing Street. This is the drama that plays out each week at prime minister’s questions – and this week the political tension was fuelled further by May’s weak and deceitful u-turn over public sector pay. 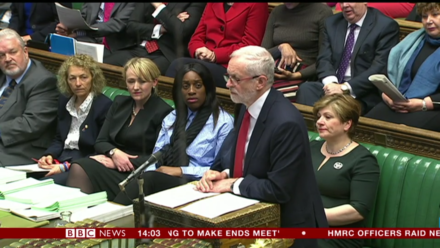 Corbyn just about got the better of it but took the curious decision not to begin with the interim PM’s latest volte-face but with a question about a UN report which highlighted “grave and systematic violations” to the rights of disabled people through cuts to the social security system. It is an important subject but represents the type of curveball that reveals Corbyn’s occasional disregard for the political news agenda – delighting fans and leaving sceptics with their head in their hands. May’s answer, as is nearly always the case these days, was a grey trawl through statistics which she rounded off by saying of her rival: “the picture he presents is not a fair one”. Wow. What a zinger that was from Theresa. Corbyn really got going when he raised the controversy of the week – the measly increase in public sector pay meted out to police and prison officers yesterday but which actually amounts to yet another cut because of the 2.9 per cent rate of inflation. “At the weekend we were told that the public sector pay cap had been dropped,” Corbyn said. Boom. The debate finally got going. Corbyn was slow to embrace the punch and judy nature of PMQs in his first year as leader of the opposition but since then he has shown a willingness to deploy a few cutting lines to make his points about austerity. May, of course, has no interest in such an approach. Why answer the question you can deliver an answer so long-winded it makes viewers forget the point? It is no wonder that these snoozathon sessions regularly last 45 minutes even though they are supposed to draw to a halt at 12.30pm. Corbyn is not exactly known for his brevity but, even if his questions are still too long, he has worked out how to marry his political argument to the demands of a weekly televised showdown. His best line came today when he ridiculed the chancellor – a former businessman who tends to wear a wry smile through the entire show – over his boasts to the Tory backbenchers’ 1922 committee. May hit back – if it could be described as such – to say that unemployment is now at its lowest level since the 1970s. Corbyn’s approach may have developed but he is still using questions sent in from members of the public. He has learnt to use them a bit more effectively and today it was the turn of “Ayesha”, a new graduate who is “scared about the future of other young people”. The Labour leader was teeing up the tuition fees debate that followed and which Labour hopes could result in a binding vote to prevent the latest Tory hike, which would take them above £9,500 and ever closed to the horrible milestone of £10k a year. This was a high-risk strategy from Corbyn – given his pre-election pledge to “deal with” the issue of historic student debt – but he didn’t get to the top of the Labour Party by relying on caveats and qualifications. May accused him of broken promises and “letting down” students but the charge didn’t quite stick, just as when the Tories tried to revive it this summer in response to Labour’s poll surge. It was a weak response by May to a muted session. The political backdrop is intense but neither party leader wants to imitate the braggadoccio of David Cameron or the scornful tone of Ed Miliband. Corbyn scored another victory but 47 minutes of this is too much for anyone, whether you are left, right or centre.